Diversity and Inclusion discussion facilitated by Dr. Carlos Hoyt on May 24 – please join us! Dr. Carlos Hoyt will facilitate our Diversity and Inclusion discussion on May 24. To accommodate your schedules, there will be 2 sessions available. One at 8am and another one at 6pm (both at the library). Dr. Hoyt will lead this discussions to help us to be open to share our visions and introduce a family survey that will be launched. 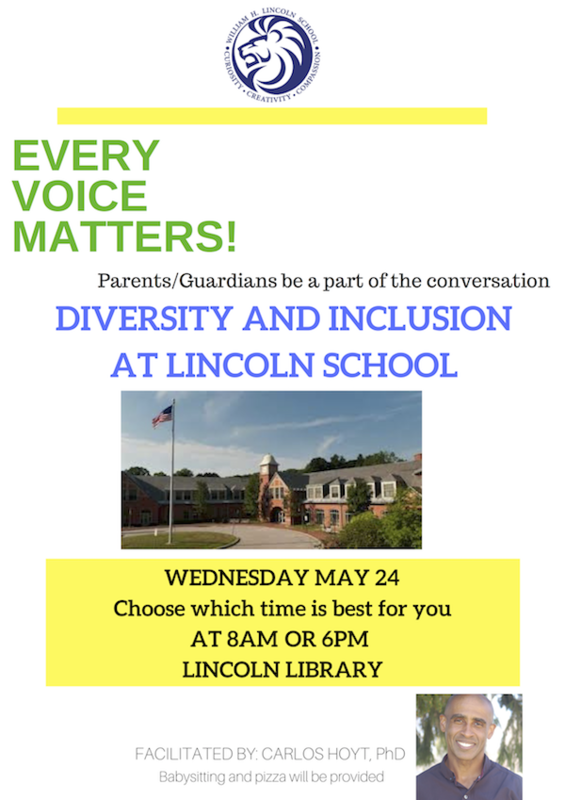 The results will help shape what we can do to make Lincoln a supportive and inclusive place for all students and families. Every voice matters! We look forward to seeing you at either session on May 24.